One year after Pope Francis’ visit to Colombia, where he urged forgiveness and reconciliation in a nation seeking to end its 50-year civil war, U.N. delegates attending an annual prayer vigil for the opening of the General Assembly were reminded that peace, while challenging, is achievable. Castro Quiroga leads the archdiocese of Tunja, Colombia, and as former head of the nation’s bishops’ conference, he spoke with firsthand experience from his work on the Colombia peace deal, which was signed in 2016 between the government and the armed guerilla forces with critical support of the local Church. 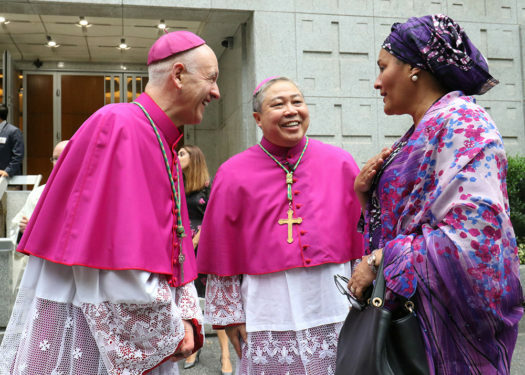 He delivered a meditation for the prayer service, which took place at the Church of the Holy Family, known as the U.N. parish, where he told the nearly 70 diplomats and over 50 religious leaders that the international community’s work in both peacemaking and peacebuilding has spiritual foundations. He noted that during Pope Francis’ visit to Colombia, he used the word “peace” some 42 times. The pope’s spirit loomed large over the prayer service as attendees recited his Prayer for the Earth from his 2015 encyclical on care for creation, “Laudato Si'”, along with his Prayer for Refugees and Migrants from his April 2016 visit to Lesbos, Greece. He urged the delegates to turn their prayers into deeds in the year ahead. Guterres, who is a Portuguese Catholic, was elected in January 2017 and has attended the Holy See’s Mission to the U.N.’s prayer service for the past two years.